-Haile Gebrselassie on his intentions to run a 10k in Hengelo in May to attempt to make Ethiopia's Olympic 10k team. -Jos Hermens explaining why Haile G isn't intending to run the Olympic Marathon in Beijing. Hermens went on to say he thought it was possible Geb could win Olympic marathon gold in 2012 in London. *Latest: Geb Now Says He Might Run Marathon If It's Start Time is Changed and Its Moved Out of Beijing The article was emailed to us and appears to be legit. We doubt his request willl be honored but by phrasing his non-participation this way, the heat on Geb may die down a little. A smart pr move for sure. LetsRun.com Week in Review: We've got it all covered and this week's piece is quite good if we must say so our selves Thumbs Up, Thumbs Down, the future is named Kaki and it has arrived, sick women's 1500, scorn, yes scorn on Haile G; Sanya Richards, Mo Greene, and a 101 year old boozer, smoker, and marathoner. Not to mention in page 2, the incredible state of Japanese women's marathoning, the sad state of US women's marathoning (Deena is 10+ minutes faster than her closest competitor at the Trials), and Marion Jones in the slammer. Meet Promoters Standing Firm Against Dwain Chambers Seriously seems like he might have an anti trust lawsuit on his hands. The performers at worlds saved the best for last. Most impressive was the women's 1500 where Yelena Soboleva broke her own wold record and picked up $90,000 as she led 4 women under the 4 minute barrier as the top 5 all set PBs. 18 year old Abubaker Kaki was almost as impresive in the men's 800, as the 18 year old led wire to wire to win in a 1:44.81 personal best as the entire field set personal bests including Nick Symmonds who finished last (6th). Tariku Bekele was nearly as impressive as his older brother as he went 3:56 the last 1600 to get the win in the 3000m as Craig Mottram finished out of the medals. Lastly, Australia's Tasmyn Lewis shocked the field to win the women's 800.The 29 year old once was a precocious 16 year old who ran in the Commonwealth Games. She credits her resurgence to her brother taking over her coaching..
Saturday: Is there anything left for the Kenyans? Deresse Mekonnen Dan Komen Deresse Mekonnen Wins 1500 Mekonnen originally won the race but was DQd along with Nick Willis (for stepping on the infield.). The DQ was protested and Mekonnen was made the winner. (message board thread on DQ here) The 1500 was the one event Ethiopians had not had a lot of success in and Mekonnen is only 20, so Kenya had better watch out (they still dominate the steeple at least). In other action Meseret Defar blew away the field in the women's 3000m with a 28.8 last lap. Nick Symmonds looked incredible in his 800m semifinal. Liu Xiang got his first indoor gold and all that is left is gold in Beijing. American veteran Allen Johnson got the silver. *Dayron Robles Out in Hurdle Qualifying!! *Jamal and Fomenko Top Qualifiers in 1500 QualifyingChristin Wurth Thomas has been sick and didn't make the final. *Day 1 Evening Distance Recap: Maria Mutola Takes First Step Towards Eighth World Indoor Title Americans Khadevis Robinson and Nick Symmonds looked good in making the 800m semifinals. Fellow American Nicole Teter ran a seasonal best to make the 800 semis on time. Kiwi Nick Willis (looked good) and made the 1500m final. In Case You Missed it: The Incredible Heather Dorniden She falls 400m into a 600m race at Big 10s, gets up, and then the rest is history as the announcer goes nuts. LetsRun.com: The Week That Was We recap all that occurred in the last week in track including the richest race in history as well as the final Japanese Olympic marathon team selection race. We cap it all off by praising some of the heroes from the American collegiate conference action including LSU's John Kosgei, Wisco's Brandon Bethke, Minnesota's Heather Dorniden, Georgetown's Joanna Rogers, Cornell's Jeomi Maduka, Chris Curtis Vollmar and the Eastern Michigan men as well as D3 stars Erin Kelly-and Peter Kosgei. Kenyans XC Camp To Start Wednesday With 33 Athletes For 27 Spots Several wild cards have been added. People who show up late will be booted off the team as Kenya is serious about putting forward a good showing to try to help repair the country's image. 104 Year Old Philip �Flying Phil� Rabinowitz Dies He reached his athletic pinnacle at the age of 100 when he set the 100m world record for 100 year olds. Big 12s: Recap: Texas Men Won by 2, Texas A&M Women Results Colorado Men 1,2,3,4 in 3k. Sally Kipyego double wins. Manzano mile and DMR wins. 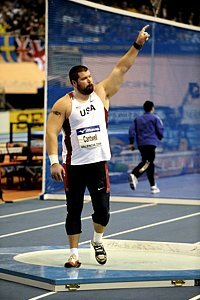 Victor Conte: "Justice is certainly very important in this world, but so is forgiveness"
*Controversy in Men's Shot Put Boston Globe The big story perhaps should have been Adam Nelson not making the team, but instead it is the feud between Cantwell and Hoffa. (We received news of Cantwell calling Hoffa a "f****** hypocrite" at the post-meet press conference) You'd think at this level, the guys or Nike or someone would make sure they have the 16 lb shot they want. Nelson won't compete for $40,000 at Worlds but did get $25,000 for winning the Visa Championships series.